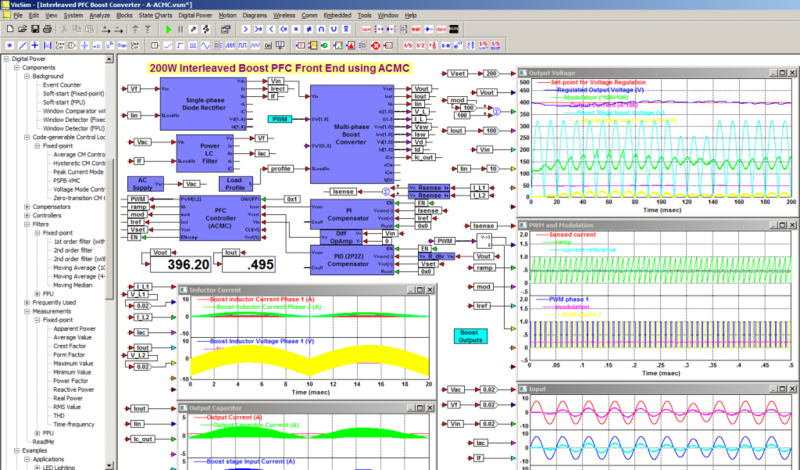 VisSim Digital Power Designer provides high level blocks for simulation and code generation of power supply and digital power components and controls. VisSim/Digital Power Designer blocks let you develop a working controller which can be directly downloaded to the MCU for digital power applications. No other simulation program currently available can do that better. The digital power blocks efficiently model analog power supply configurations along with control loops to simulate and verify the control loop without the need for hardware, avoiding the risk of damaging your hardware. Thus, you develop your control routines much more flexibly, simulate, verify and make any needed corrections before you send Gerbers out to get hardware manufactured. When your hardware arrives, you can use VisSim/Digital Power Designer to compile and download the diagram to the MCU and test your real hardware. Buck, Boost, Buck-boost, Multi-phase Buck, Boost and Buck-boost, Sepic, Cuk and Zeta converters, Full-bridge converters, Half-bridge converter, Push-pull converter, Flyback and Forward converters, Rectifiers and Bridgeless PFC converter. Converters can be cascaded or paralleled for more complex converter configurations. Voltage mode controller, Multi-phase voltage mode controller, Peak current mode controller, Average current mode controller, Hysteretic current mode controller, Power Factor Correction (PFC) controller, Phase Shifting Full-bridge controller, Zero-transition current mode controller (boundary mode). Custom controllers can be easily developed in VisSim. PI, PID (traditional), PID (2p2z), Types I, II and III compensators, 3p3z compensator. Simulates time delays, quantization, ZOH, and saturation effects. AC source, DC source, three-phase AC source, controlled sources. Sources include large variety of options and nonlinear effects. AC current transformer,isolated current sensor (Hall-effect), isolated voltage sensor, Sensing resistor (current sense), resistive divider (voltage sense). Models of various voltage and current sensors for control loop simulation. ADC, DAC, Dual PWM (C2000), eCAP PWM, eCAP, analog comparator, ramp generator, GPIO. Simulates and visualizes ADC and DAC quantization effects. Includes up to 4 time regions with configurable start, duration and transition effects. Calculates compensator and filter analog s-coefficients, poles and zeros and digital z-coefficients to provide a starting point for power converter compensator designs. Enter in the analog component values, converter power stage values or directly the compensator poles and zeros to generate the z-coefficients for a digital compensator or filter.